Welcome home. There’s no place like it: Comfortable, safe, a place to dream, plan, celebrate life!  TheBrickRanch.com began in March of 2007 as a way for me to share Huber Heights Ohio real estate information with consumers. I wanted to throw open the doors and windows of real estate, shake the cobwebs from the curtains and let some fresh air and sunlight into the business. To my way of thinking, buying a home is more than four walls, it’s often your life, your dreams, your happiness. The more information we share with each other, the better we can work together to meet your goals. The Brick Ranch blog is about Huber Heights and having an honest conversation about life here. You could think of this blog as a big family table. Go ahead — get a cup of coffee, kick off your shoes, and pull up a chair, let’s share some information. I am a full time Realtor with The Home Group Realty Co so I will share what I know about real estate: Not only the real estate market, but the neighborhoods that make the Greater Dayton area a place unique to live. How does the real estate market work? What is the process? What new ideas are on the table? Let’s talk about how all this affects you. Want to make sure you never miss a post from TheBrickRanch.com? If you subscribe to our content, you will be notified about every new post. Information collected by TheBrickRanch.com is kept in the strictest confidence. Contact information is never shared with third-party vendors, other web sites or telemarketers.